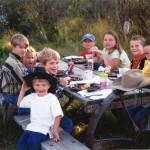 During the summer guest ranch season, buffet meals are served three times a day at 8 am, noon, and 7 pm, after cocktails at 6pm in the John Wayne Saloon. Every “home cooked meal from scratch” is prepared by our guest ranch chefs and served in the historic main lodge dining room near the large river rock fireplace. The hearty western or gourmet meals are supplemented with fresh salads, fruit, homemade breads, pastries and desserts at every meal. Not everyone can eat like ranch hands, so let us know well in advance about special diets and we will try to accommodate your needs. Dude ranch guests begin every morning with hot or iced coffee or tea, fresh fruit smoothies, a fresh fruit plate, homemade pastries, and a variety of freshly prepared hot breakfast items from the buffet. Lunch and dinner menus appeal to the appetites of young and old alike with a variety of fresh salads, homemade breads, and desserts accompanying delicious main courses choices. The John Wayne Saloon features a variety of sodas, wines, liqueurs and other alcoholic beverages. 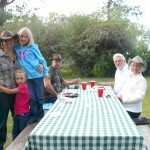 Tuesday and Thursday evenings guests are in for a treat for our All-American picnic and Campout. 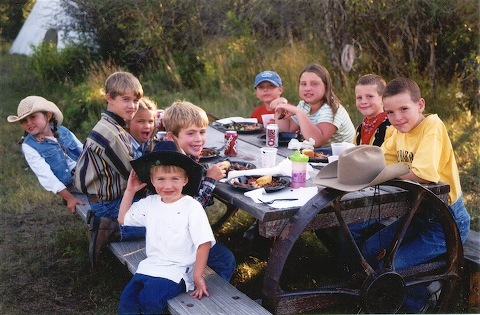 Tuesday evenings guests join a fiddle and guitar player on the horse-drawn wagon ride around the ranch, returning to the John Wayne Saloon for entertainment along with an All-American Picnic. 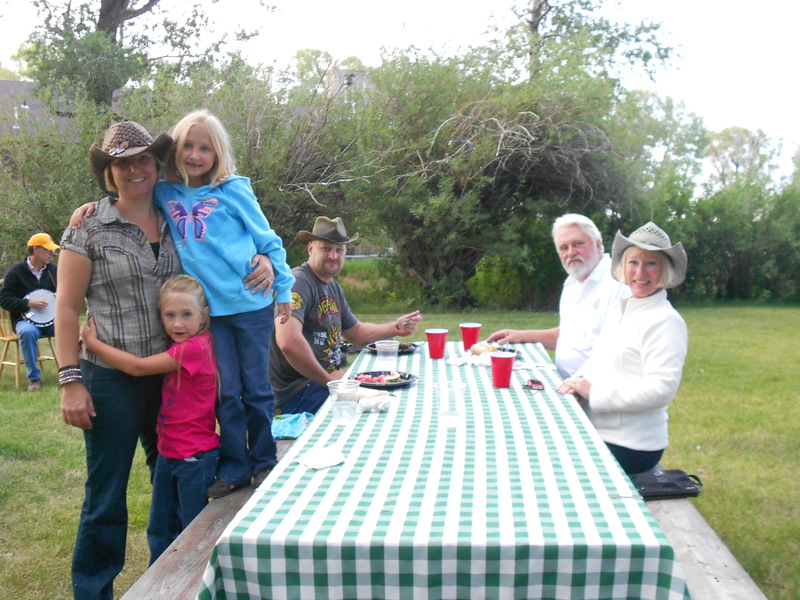 On Thursday evenings guests enjoy a BBQ featuring ribs and chicken over the campfire at the ranch campsite nestled in a canyon near the edge of the Medicine Bow National Forest. After a night of sleeping out in teepees under the stars, guests enjoy a hearty “breakfast on the range” before beginning their horseback ride. Click here to see the Bed & Breakfast dining menu.